"Six years of treatment on 300 patients demonstrated a 97% improvement in the intensity and duration of vertigo attacks," Journal of Upper Cervical Chiropractic Research. Read the full paper at McCoy Press. Michael T. Burcon, B.Ph., D.C. 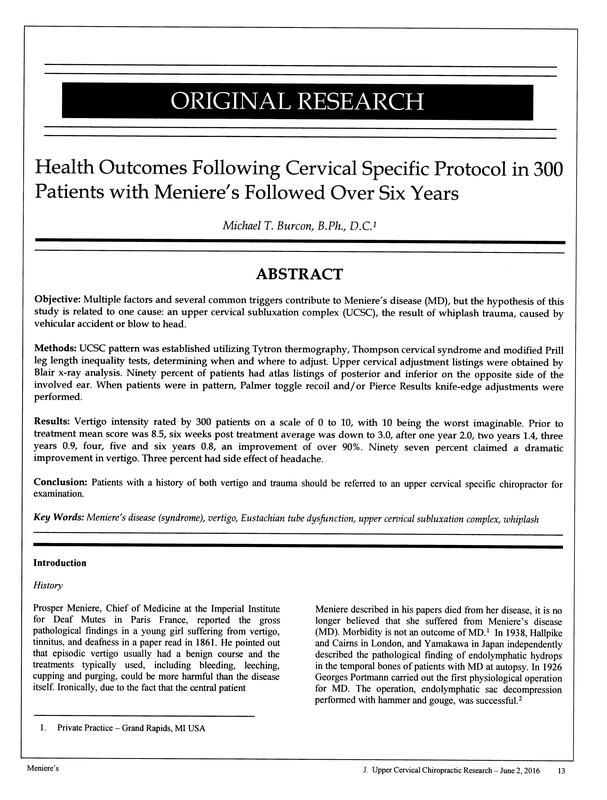 Ten thousand Meniere’s patients have been helped by cervical specific care since the Journal of Upper Cervical Chiropractic Research published "Health Outcomes Following Cervical Specific Protocol with Meniere's Followed Over Six Years," in 2016, 155 years after the disease was described by Prosper Meniere. Over one thousand patients at Burcon Chiropractic’s Meniere’s Research Institute have shown a dramatic improvement in vertigo in over 90% and hearing in over 30% of these cases. Vertigo is the most debilitating symptom. You feel like you are spinning in circles. It includes nausea with vomiting, nystagmus and sweating. It is followed by fatigue and can lead to anxiety and depression. Michael T. Burcon, B.Ph., D.C., director of the Institute in Grand Rapids, MI developed a protocol to blend Blair Upper Cervical Specific chiropractic with Pierce Results lower cervical work. This more intensive approach leads to faster results in difficult cases. He discovered the most common cause of Meniere’s in 1999 and his research is quoted in the Merck Manual. 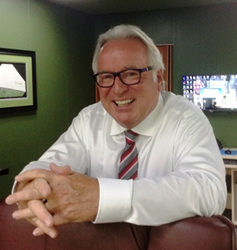 Dr. Burcon has spoken at every International Meniere's Disease Symposium over the past 13 years, including the 7th Meniere's Symposium in Rome, Italy in 2015 and the 6th Symposium in Kyoto, Japan in 2010. 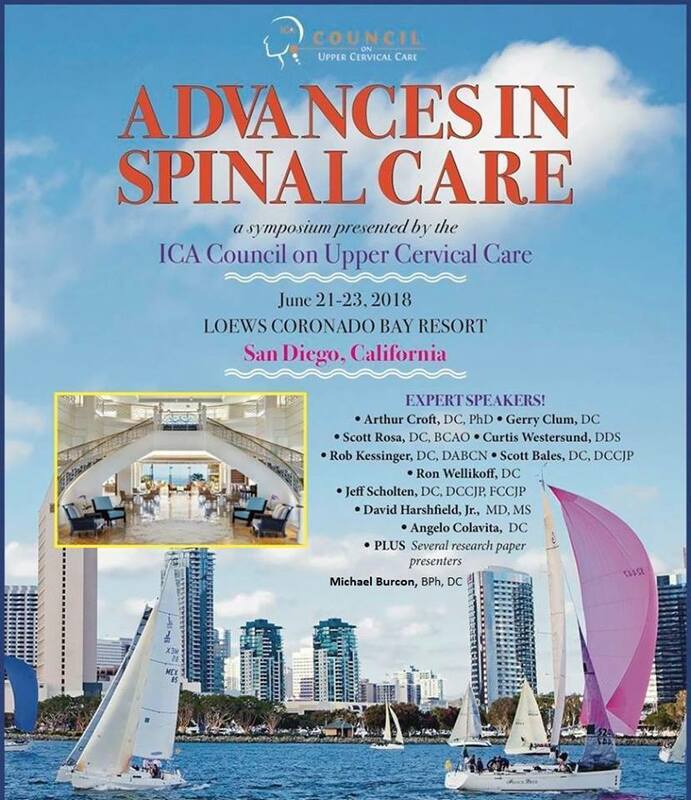 Dr. Burcon’s next presentation will be in San Diego, CA at Advances in Spinal Care, a symposium presented by the ICA Council on Upper Cervical Care. He will be speaking to chiropractors at 1:45 pm on June 22 at Loews Coronado Bay Resort. He will be offering a one-hour workshop at the resort on his protocol for Meniere’s patients, their doctors and caregivers at 1 pm on Saturday, June 23, 2018. Registration is free. "The reason it took so long to discover the cause of Meniere's disease is simple," said Burcon, "it takes an average of 15 years from the time of the trauma, a whiplash/concussion injury caused by a vehicular accident or significant blow to the head, before the onset of symptoms." Ligaments are damaged allowing an upper cervical subluxation complex to slowly develop. The brain slips lower into the foramen magnum, slowing the flow of cerebrospinal fluid out of the skull, creating normal pressure hydrocephalus. The skull acts as a closed hydraulic system, so less blood flows into the head and inner ear. Meanwhile, the patient has forgotten the injury. 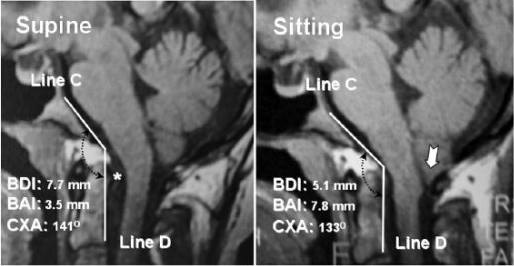 This syndrome is often missed on supine MRIs. 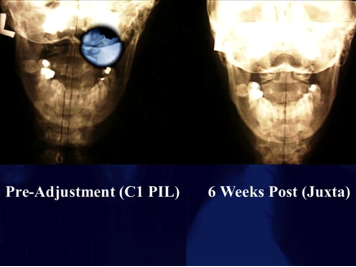 All films should be taken upright and should include the cervical spine in addition to the head, focusing on the Craniocervical junction between them. Most patients are diagnosed with Meniere's in middle age, because they were injured in high school or college, when they were learning to drive, playing sports or attempting to do something they came to regret. Luckily, it's not too late to benefit from upper cervical care. These doctors take postgraduate training to get certified in their technique. They spend more time testing and creating an adjustment, based on x-ray analysis, tailor-made for the patient. 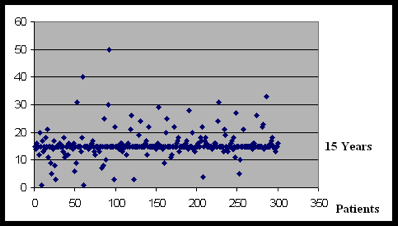 Patients from West Michigan get checked 12 times over four weeks, out of town patients over one week of intensive care. The doctor's wife, Jane, works as a concierge to assist the patients before, during and after their visit. She is available Monday, Wednesday and Friday 9:30 am to 4:30 pm EST for more information, to schedule an appointment or register for San Diego workshop.